In late afternoon, the last shavings of another day curl onto the wood shop floor of Gary Weeks & Company in Wimberley. While his son, Austin, closes up, Gary joins his wife, Leslie, a few steps away in the office/showroom of their handcrafted furniture business. A dining table and six chairs grace one side of the room. In a corner stands Gary’s signature design, the Weeks Rocker. He nods at the rocker in an invitation to sit. Instantly, when seat touches seat and spine settles against the back, I know this isn’t my grandfather’s rocker, with its creak and antimacassar. His old cane-bottomed seat begged for a cushion, and the slats of the back prodded the lumbar like a reminder of a chore left undone. This Weeks Rocker wraps me in wood. With the curve of its back and the scoop of its seat, hardwood feels as soft as any cushion. They accommodate the tall and small. A 5’4" mom and her baby fit nicely. So does a center for the San Antonio Spurs. 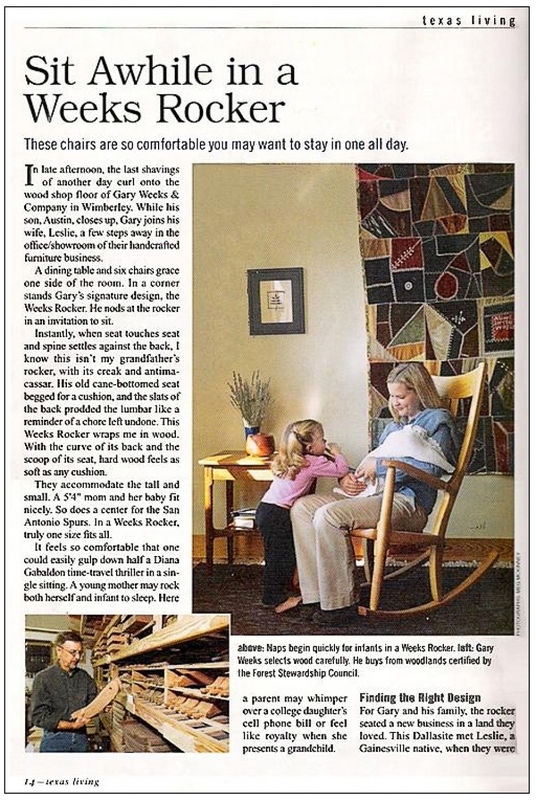 In a Weeks Rocker™, truly one size fits all. It feels so comfortable that one could easily gulp down half a Diana Gabaldon time-travel thriller in a single sitting. A young mother may rock both herself and infant to sleep. Here a parent may whimper over a college daughter’s cell phone bill or feel like royalty when she presents a grandchild. For Gary and his family, the rocker seated a new business in the land they loved. This Dallasite met Leslie, a Gainesville native, when they were students at The University of Texas at Austin. Later, while they were living in Linden near the Louisiana border, Gary renovated homes and did contract carpentry. In his woodshop he built a little workbench for their eldest son, Austin, whose first word was “hammer.” With the boy banging beside him, Gary tinkered with the design for a new rocker. He was also building bed frames and shipping them to an Austin store. In 1987, the family shipped themselves to the Hill Country, settling into Wimberley. Here the Weeks Rocker really took shape. Gary searched for a design that would ensure comfort and look elegant but was still durable enough to withstand Texas, time, and the tumble of grandchildren. "I wanted to have a handmade, hands-on product that had a hearth-and-heart connection and maybe to make enough of them so they wouldn’t be quite so expensive," he recalls. As the company’s reputation rose, however, his time in labor fell and the Weeks inventory grew. Gary designed tables -- square, round, and rectangular -- in the same clean lines of the rockers. Around them he arrayed his Wilson chairs, named for Leslie’s family and honed like the rockers to fit the body’s shape.While you sink into the rocker, the table chairs lift the lumbar. You are comfortable during a long dinner party, while youngsters can more easily sit up straight. Good wood helps both durability and appearance. The family builds furniture from careful selections of cherry, walnut, maple, mesquite, and mahogany. All the woods except mesquite and walnut come from forests certified by the Forest Stewardship Council. One or more woods go into custom inlays -- such as Texas stars, brands, and even corporate logos -- that many customers order for their rockers and chair backs. Then after craftsman Rich Hart hand rubs an oil finish, Gary or Austin signs, numbers, and dates each piece under the seat. On some days, the whole family ends up working together. Leslie oversees accounting and the showroom. Son Zachary, a recent graduate of Texas Tech University, helps out, as does daughter Aubrey when she’s home from Southwestern University in Georgetown. Meanwhile, Gary works on his next design -- a rocking chair for a guitar player that will give the musician freedom of movement. "The arms will have to be off, and that introduces a lot of structural problems," Gary muses. "But I’ve had several requests, and I play guitar a little bit." Soon, before a fire or swaying on a front porch, some musician will launch the first notes of a new Texas song, created to the easy cadence of a Weeks Rocker.